I recently was guided to Bruno Latour’s lecture from 2008: A Cautious Prometheus. The lecture is a brilliant description of design, its increased importance and saturation into the world, its promises and advantages and an interesting argument how it is in opposition to modernism. Though he does not mention systems at all there are many things that resonate. His notion of “Thing” as a grouping of things objects meanings materiality and symbols and the need to get at grasp with this. The notion of the cautious Prometheus resonates with our credo to be both humble and brave. And in the end he asks for a way to draw the complexity of the thing and he states that the lack of such a way of drawing is the biggest obstacle. It resonates to our attempts of developing gigamapping. When generating the list of Gigamapping projects found on the net I came across this one. 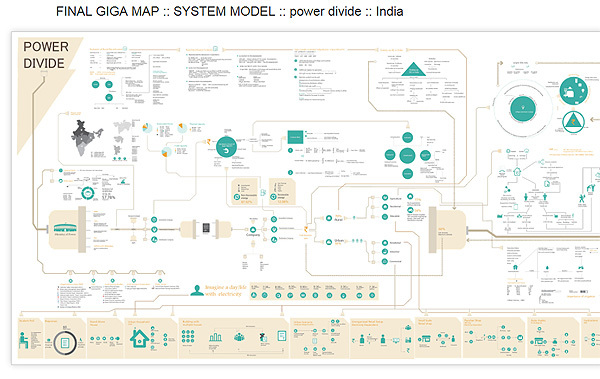 It is Systemic Design the Indian way, made by students of NID taught by Professor Praveen Nahar. I always found these projects top quality and very interesting. Click the image to see more. 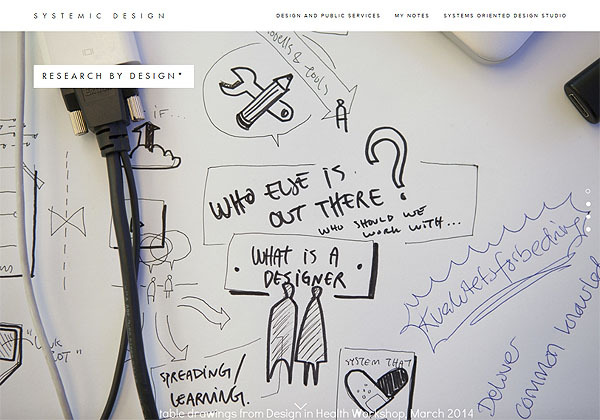 Make sure to investigate the many versions and iterations and the different suggestions. The project is very energetic! 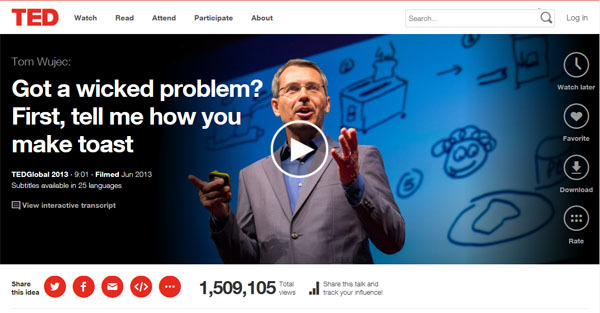 Tom Wujecs TED talk is right up our alley. He manages to explain systems thinking easily with the example of how to make a toast. Tom is a designer and Autodesk Fellow. In SOD we have a similar approach with the "Mapping Me" exercises in SOD. We all have schemata about concepts but interestingly also about processes. Schemata, typologies, archetypes simplify complex processes into manageable clichés and we "forget" the details. Nobody get impressed by the fact that you are going to cook a dinner but if you start to unfold the process it turns out to be super complex and difficult also when coming to timing, involving cultural issues , chemical processes etc etc and its links to raw materials and countries far away. Alos interesting observations that group work gets more complex and that talking in the groups makes things less productive. We have similar experiences. There are several points though where iI would slightly disagree. 1) We avoid sticky notes because they have a big influence on how people think. They tend to make people emphasize the objects (nodes) on the cost of the relations. In his presentation he has minimal attention to the relations. To make students move their attention from the objects to the relations, getting beyond the point where relations are drawn only by lines or arrows is a big challenge. 2) We work a lot with time lines mixed with nodes and connectors. This helps to develop understanding of how processes flow rather than evolve stepwise. 3) We work with mixed models and types of information in the same gigamap, not only nodes and connectors. This could be embedded diagrams, images, texts etc. 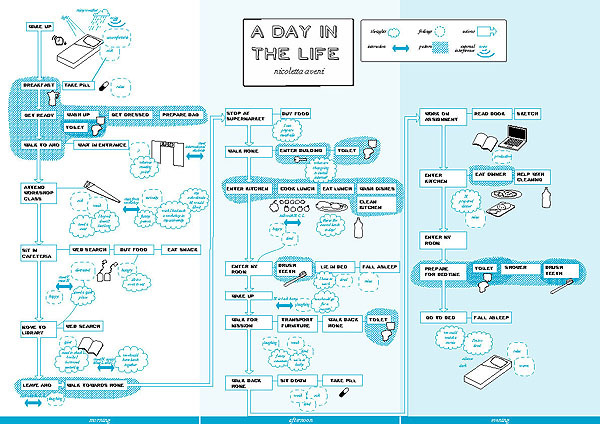 This helps to relate items that are categorically different, creating links and relations across category boundaries. Here is a link to a list of types of systemic relations we made to help move emphasis from objects to relations. There typically is more than one relation between two entities. I really like the large mappings towards the end of the video. They resemble gigamapping and the Rich Design Space concept. Below are two pictures of the Mapping Me exercise we use as a start for students to learn systems thinking with themselves as case. These are from 2011 by student Nicoletta Aveni. 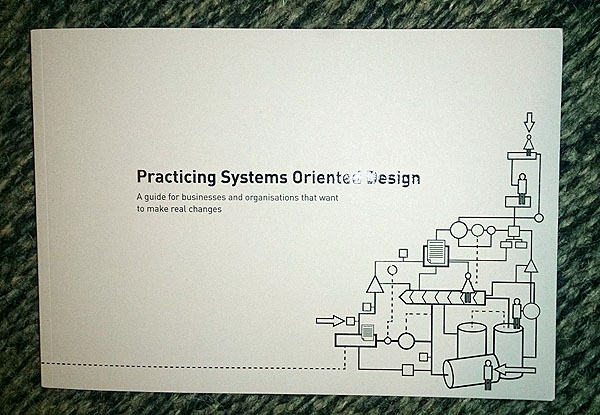 We recently published a small book to be used as an easy way to get into Systems Oriented Design. It was written by Jonathan Romm, Adrian Paulsen, both from HALOGEN, and me. Published by the Oslo School of Architecture and Design. Together with Elisabeth Skjeltens book, Complexity and Other Beasts they form a pair that we hope will be valuable in practicing SOD.